Upper Deck confirmed several short-prints exclusive to retail and Trader Jack's blog has some of the info here. So far one of the Sarah Palin cards has popped up on eBay. How many of you are really going to go after this card? Political affiliations aside, I'm not that interested in collecting this card. But, if some of you have read the blog before you know I don't care for variations and the such. Perhaps as a set collector that just isn't my thing. There are other variations that have appeared on eBay. 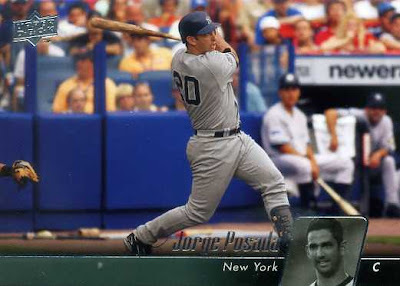 Like this Jorge Posada card. 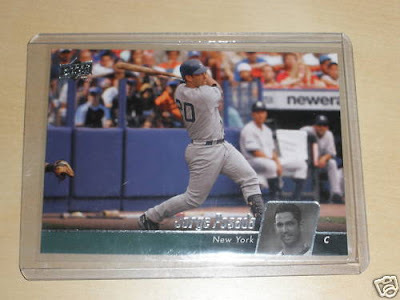 That, according to the eBay auction, is the variation card. This card is the regular one. Some one wanna tell me the difference? The other subtle, ever-so-slight difference in the variation is that Jorge has a personality and talent. Bwahahaha....sorry had to Yankee-hate. Also, the bat in the hands of the player in the chair is missing. The wall in the back is purple in one, and blue in the other. Those are some subtle differences, eeeesh. I never was good at those Highlights games. The yellow shirts are missing in the crowd. Reminds me of "Hocus Pocus". The wiki has quite a bit of info on the double-take gimmicks. They took the time to airbrush a guy with a yellow shirt in the background but left all the damn logos on there? Jeebus. I can't tell. It looks like Posada stole Willie McGee's neck in both photos.